These rockers could be earned in the early days of Grimes by attending multiple years. However, they were ordered to fit a round patch, and the Grimes patch was rectangular. 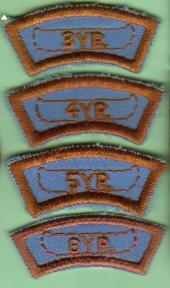 So after a few years, ranger Wayne Hamm had the council order the multi-year paddles which would fit the Grimes patch.